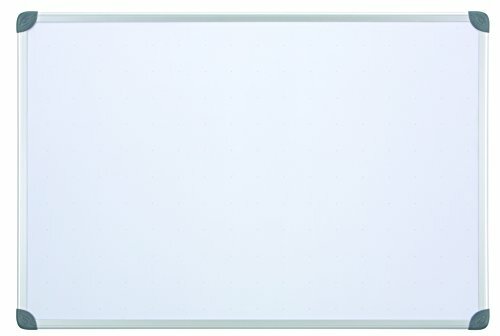 Magnetic, dry-erase surface of the whiteboard doubles as a magnetic bulletin board to offer more functionality. European style, brushed aluminum frame delivers a polished look and complements any modern décor. Corner cap mounting system secures the 2' x 3' board to wall in four places for a more solid hold. Plus, board can be mounted vertically or horizontally to better fit your space. One Quartet dry-erase marker and two round magnet accessories are included. Convenient marker tray is attached to bottom of frame to keep all your accessories handy. 60-day warranty. Magnetic dry-erase board with stylish frame is suitable for home or office use. Plan a family getaway or create polished presentations. Office Marshal Professional Magnetic Dry Erase Board | White Board | Test Score: Excellent (A/1.3) - 36" x 24"